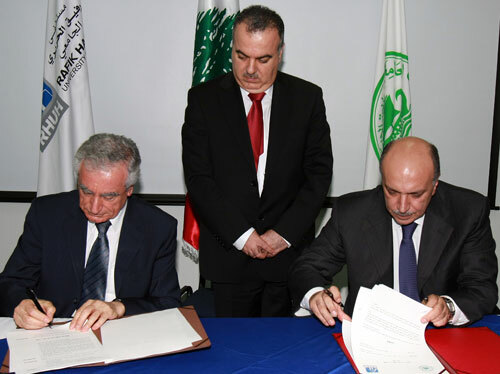 LAU’s School of Medicine has gained a major partner in its mission to educate and train new generations of medical doctors, as it signed an agreement with the Rafik Hariri University Hospital last week in Beirut. Dr. Jabbra and Dr. Wazzan officialize the agreement in the presence of Minister Khalife. High-level officers from LAU and RHUH with Minister Khalife during the signing of the affiliation agreement on June 13. The affiliation will “provide LAU with an excellent facility for the training of its students, residents, and fellows,” said Dr. Kamal Badr, the school’s dean. It will allow students to gain experience in inpatient and outpatient treatment and observe directly a variety of medical and surgical cases, from the outset of their medical education. LAU faculty will cooperate with the hospital’s physicians to train medical students and post-graduate residents and fellows. The school will also administer a laboratory for human genetics research within the overall lab structure of the hospital, and it will run the clinical research center that exists at the hospital, but needs an academic institution to operate it with high quality standards, Dr. Badr said. According to Dr. Badr, RHUH is the largest public hospital in Lebanon. It was built in Jnah, Beirut, in the late 1990s and started its operations in 2003. Dr. Badr says it was “equipped with all that is needed to provide the best medical care to its patients,” and LAU feels privileged to establish this affiliation. He added that as a governmental institution, RHUH attracts patients from all over Lebanon, making it an ideal place for conducting training and medical research programs, while at the same time serving the local population with high-quality care. The signing ceremony gathered Minister of Public Health Mohammad Khalife, LAU President Joseph Jabbra, Vice President for Academic Affairs Abdallah Sfeir, Dean Badr, RHUH General Director Wassim Wazzan, and RHUH Chief Medical Officer Zouhair Tabbarah, at the hospital’s premises. This agreement complements the school’s first clinical affiliation agreement, signed with the Clemenceau Medical Center, an affiliate of Johns Hopkins Medicine International, in July 2007. Plans for additional partnerships with medical institutions and centers are being studied.